UNC is honored to be a sponsor of this wonderful community event. 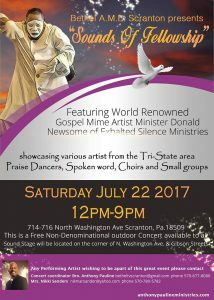 It will be an inspiring gospel/jazz outdoor experience on Saturday, July 22 from 12:00 – 9:00 pm. The sound stage will be on the blocked off Street located at 714 North Washington Avenue between Pine and Gibson Streets in Scranton. Bring the family for food, games, fun and, of course, the fabulous entertainment. More information: Click Here.